The American Academy of Pediatric Dentistry recommends that parents take their child to visit the dentist by no later than the child’s first birthday. What an excellent way to begin the education needed to create a healthy smile and maintain beautiful teeth for a lifetime! When you first arrive, you will be greeted by our friendly team members, and then it’s time to play! Little Heroes provides an aquarium, video games, movies and plenty of other fun to keep your child entertained. When your child’s name gets called, it’s their turn to step on a scale and stand tall, so the hero helper can learn their weight. After that, they will test their hero strength with our cool blood pressure cuff and record it on his or her chart. The Super Power Chamber is a wondrous space where cool equipment gives the Little Heroes team x-ray vision of your child’s teeth and gives your child super powers and courage! At this point, your child has earned his or her super powers complete with boundless bravery and a genuine Little Heroes Cape. Newly caped heroes can view the images of their teeth on a big screen and make sure no Sugarbugs are hiding in and between them. protective hero sunglasses at this point to protect their secret identity for a bit! 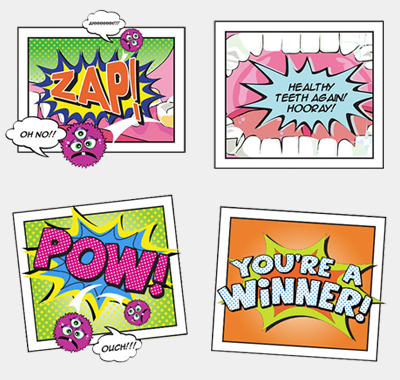 One, two, three…The Incredible Dentists will check each of your Little Hero’s teeth with their “tooth tickler” and count them out loud. Try not to laugh too much. The doctor is checking to make sure all their teeth are healthy, clean and strong. Little Heroes has lots of gizmos and gadgets used to keep your child’s teeth clean. First, Woosh! A Magic Toothbrush will speed along their teeth with some great tasting toothpaste. Next, Swish! A radical rinse gadget will wash away all the defeated Sugarbugs; what a scuffle! Then, Zing! We wiggle fantastic floss between each of their teeth to chase out any Sugarbugs left hiding. Last, but not least, Zap! they will paint your Little Hero’s teeth with some “tooth vitamins” that tastes great and keeps their teeth nice and healthy. Awesome Job Little Hero! At Little Heroes, the team always looks forward to seeing you and your child at their next visit. Before the Little Hero and their parents rejoin civilian life, they will take a stroll down the Hall of Heroes where they will receive their mission at the Mission Outpost and get their next appointment for your child to come recharge their super powers! Good luck fighting the Sugarbugs! Little Heroes Pediatric Dentistry believes in you!